A dangerous hurricane has prompted state and federal authorities to issue a variety of travel warnings and advisories that will impact and disrupt trucking operations along with Louisiana and Texas coast for the next several days. Latest reports say Hurricane Harvey is a Category 2 storm, with the potential to reach Category 3 by the time it makes landfall. According to the National Hurricane Center, Category 3 hurricanes have great potential for structural damage as far away as 25 miles from the eye of the storm. Meteorologists say the storm could dump as much as 30 inches of rain on affected areas. Sustained winds of 111 mph are also possible. Drivers in the storm’s footprint should be aware of the potential for severe flooding, says the Texas Department of Transportation. The agency says the heavy rainfall, combined with storm surges up to 5 feet, will cause dangerous flood situations on roadways along the coast and is urging drivers to exercise caution and simply turn around when confronted with submerged roadways. Currently, Texas DOT says the state is prepared, and storm response rescue and maintenance crews are positioned and ready to go once the full brunt of the storm hits the coastline. As of 10 a.m. Central time Friday morning, the agency was advising drivers to suspend all non-essential local travel in areas affected by the storm. The storm also may affect fuel prices. This is an area rich in petroleum refineries and off-shore drilling operations, many of which are shutting down in advance of the storm. Hurricane Katrina, which hit the Gulf Coast in 2005, caused about a 40-cent increase in fuel prices overnight. Tom Kloza of the Oil Price Infomation Service tweeted Thursday, "Gasoline season may end with a bang, and not a whimper. Worries about Hurricane Harvey add 4-8cts gal to spot prices today." By 9 a.m. Friday morning he was reporting that spot gasoline prices were "screaming higher," hitting $1.73 per gallon at 9 a.m., up from $1.50 per gallon Tuesday. 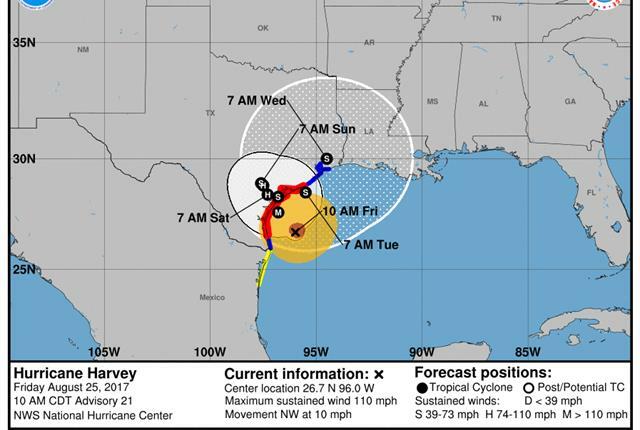 For up-to-date information on conditions and travel advisories in areas affected by Hurricane Harvey, follow the TxDOT Ferry Twitter feeds, @GalvestonFerry and @PortA_Ferry, as well as @TxDOT_CRP. Additional updates can be found on DriveTexas.org and on Facebook, www.facebook.com/txdot and Twitter, www.twitter.com/txdot.